From the very start The Sykes–Picot Agreement was a time bomb, the ticking of which we have not been able to stop in a hundred years. Chaos is the only alternative to already established borders. Modern terrorism is the worst threat to global peace and stability. Super high politicisation of the issue of terrorism complicates the search for a consensus on the status of individual organisations. Consolidation of governmental and civil society institutions in the Middle East and the drafting of a roadmap for the economic recovery of states in the post-conflict period are no less important than the settlement of conflicts. Russian Aerospace Forces operations in Syria facilitated the change in the domestic balance and opened opportunities for breakthrough solutions on the road to political settlement. A political process in Syria would not only help find a compromise between the key players on the Syrian political field but would also build up trust via cooperation between the main external and regional participants in the conflict. Regional and global cooperation in the Middle East requires the elaboration of agreed-upon and more coherent rules of the game. This is achievable through negotiations of the interested parties, not only of individual conflicts, but also in relation to the general development strategy in the Middle East and the future of its nations. The formation of a regional security system must rule out unilateral military action without the relevant mandate and in violation of international legal standards. Addressing the issue of regional security, including Russia’s concept of creating an area free of weapons of mass destruction, demands that its framework, main tasks, and parameters all be redefined. The already available developments should be combined with those approaches, that to a larger degree, take into account the modern dynamic of the on-going military-political processes in the Middle East. The mass-scale protests in Arab countries triggered a tectonic shift in the Middle East. Its entire system of cultural, social, economic, and political relations is undergoing reconstruction. This reconstruction can be attributed to mostly internal causes – political, economic, cultural, and civilisation-related – but there is an obvious link to the most alarming trends of global development. Its gist lies in the loss of control over international processes, the return of the factor of force, the growing role of accidents, the strengthening of the world’s periphery, and the crises of national states and identities. In some countries participation in politics is expanding, political systems are modernising and part of the political elite is being replaced by new blood; people are now conscious of the fact that reforms are required and that there needs to be effective responses to new threats and challenges. However, the weakening and, in some cases, the destruction of statehood in a number of countries, the civil wars in Libya, Yemen, Syria, and Iraq, the hundreds of thousands of victims and millions of refugees, various humanitarian catastrophes, the expansion of terrorism, and the consolidation of the Jihad alternative, now a global threat, have all become very signi?cant factors in the current world. The overall result of the region’s transformation is so far negative. The resetting of the regional system of international relations has triggered the destruction of old alliances and the formation of new ones. Non-governmental actors that sometimes pursue their own goals and sometimes act on behalf of external forces are playing a key role in this process. The countries destroyed by civil wars have turned into arenas of proxy wars. The transformation has not yet reached its apogee, not to mention completion at any level. The outlines of the region’s future arrangement are not yet visible and there are still no grounds to talk about the complete dismantling of the old system. Many regional states have largely adapted themselves to the new conditions. Yet it is unknown whether they will lay a solid foundation for a new Middle East or will be plunged into the whirlwind of turbulence. Russia is convinced that the all-round consolidation of their institutions is just as important today as the settlement of all current con?icts. Under the circumstances, the Russian Aerospace Forces operations facilitated the change in the domestic balance and opened opportunities for breakthrough solutions on the road to political settlement. Russia made this unexpected decision not to consolidate its in?uence in the region, but rather due to its concern over the growth of destructive trends near its borders, the pinnacle of violence and terrorism, and the agony of statehood. The enormous growth of violence in the sizable territories of Syria and Iraq, Libya and Yemen and the fact that this violence is now the basis for an entire system of socio-political relations are directly related to the fragmentation of societies, national identity crises, and the actualisation of the old social splits and the formation of new ones. But the political reason must be attributed to the destruction of the Sykes-Picot system. This system that took shape in the colonial era, was based on a combination of Western administration with partially modernised, albeit still largely traditional, social structures and a diversi?ed economy. This inevitably led to the preservation of both traditional identities and social contradictions, and eventually gave way to the gradual aggravation of social splits. A strong government machine was able to curtail this social fragmentation for a certain period of time, but the imbalances of institutional development were gradually reducing people’s resilience to challenges. Strong institutions of executive government and advanced technocracy were combined with the exclusive status of law enforcement agencies and weak bodies of judicial and legislative power, which lead to the almost complete absence of civil society and ultimately the general alienation of citizens from the political process. As a result, these countries were incapable of adapting to growing political participation. Events in the region, no matter whether they took place within the framework of state institutions, as in Egypt, Tunisia, or Morocco, or outside of it, as in Libya, involve traditional layers of the population into the political process, accordingly adapting political life to traditional patterns. If the events develop under a soft scenario – without the destruction of state institutions – they may make the state more ef?cient in the future. If they unfold under a tough scenario, as in Libya, Syria, or Yemen, wider participation leads to the destruction or at least the degradation of statehood and any political actions are doomed to follow traditional pattern. Depending on the circumstances, this may lead to the growth of tribalism (as in Libya) or ethnic and religious tensions (as in Syria) or both (as in Yemen and Iraq). The mounting role of personality is yet another consequence of these weakening institutions. Political leaders often turn into the only real carriers of sovereignty who are capable of making decisions in the event of an emergency situation, thereby making the ensuing events even less predictable. The same applies to the heads of non-government actors, such as political movements, parties, ethnic and religious communities, tribal chieftains and the like. Personal ambitions, a peculiar perception of reality, struggle for power and access to funds, and the actor striving to maintain his personal security all begin to play a certain role in the elaboration of a political strategy. Pursuing the consolidation of government in parallel with civil society institutions and improving the ef?ciency of administration are becoming an urgent need for all countries of the region, and the only opportunity for ensuring their security in the future. How can this be achieved and what role can the international community play in these processes? These questions still have to be answered. The US approach with its emphasis “on support for democracy” and the European accent on the defence of human rights usually boils down to the backing of opposition forces. At the same time, consolidation of statehood often comes down to the protection of the ruling regimes. It’s therefore possible that key roles should be assigned not to individual non-regional actors but rather to international organisations, primarily the UN, and such structures as BRICS. The Sykes-Picot system has one more dimension: it was an attempt to establish national states on the territory of historically fragmented countries that survived dual colonisation – Ottoman and European. The borders of these new states were formed, if not completely arbitrarily, then under the in?uence of accidental factors. As a result, it led to a de?cit of legitimacy that is now inherent in the Arab political mentality. The existence of any state has never been viewed as absolutely natural and therefore can be called into doubt at any time. At the same time the region has existed within these borders almost for a hundred years, during which new identities and specific political cultures have taken shape and socio-economic infrastructures have been built within the borders of actual national states. Chaos is the only alternative to already established borders. Principle differences in the narratives of Israel, Iran, Saudi Arabia and other actors, including non-regional and non­governmental ones, pose a very serious problem. The “wars of narratives” lead to the growth of regional tensions, thereby preventing key players from establishing dialogue and drafting a common image of the future Middle East. Incidentally, global players have not yet formulated their strategic vision of the Middle East either. Without this vision it is impossible to slow down these negative developments. In the meantime, the region’s countries may have very different visions for their future. Some politicians express crazy ideas in a bid to mend the shreds of the Middle Eastern fabric for lack of other alternatives. For instance, is it possible to de-centralise unitary states (if they cannot be preserved) along ethnic and religious lines? Won’t it mean the revival of archaic concepts and the final renunciation of the national state concept that implies common values and identity for all ethnic and religious groups? How far can de-centralisation be pursued? Given weak state and civil institutions, won’t federalisation serve to camou?age the destruction of statehood? Or does it make sense to embrace concepts of democratic confederation and regional integration at the non-governmental level? Could the establishment of a constitutional monarchy and the ensuing complete change of political systems ensure stability in those countries of the region that have been ravaged by war the most? IV. Economic Recovery – Mission Possible? The regions mostly systemic economic development problems begin to play a special role in the described conditions. The risks involving food security are high: droughts, soil erosion and especially water shortages have become permanent factors capable of inciting con?ict. In the next 30 years, the gap between the demand for water and renewable water resources will exceed 51 percent. However, the dif?culties caused by current political upheavals, wars, and terrorism may be exerting all but a bigger impact on the situation in the region. Last May the IMF registered Libya’s balance of payment de?cit in 2015 at 52.8 percent of its GDP and its budget de?cit at 68.2 percent of its GDP, the relevant figures for Iraq being 9.6 percent and 10 percent, respectively. Hundreds of billions of dollars and several years of hard work will be required just to restore Syria’s destroyed housing and infrastructure. It is uncertain whether Arab oil exporters would like and would be able to play a key role in the economic recovery of civil war-destroyed countries. Oil exporters are experiencing serious drops in revenues from oil sales and this is a potential problem for the region. Thus, in May 2015 the IMF assessed the currency losses of the members of the Cooperation Council for the Arab States of the Gulf at $287 billion (or 21 percent of their aggregate GDP), estimated on the basis of their potential revenues in October 2014. In October 2015 the IMF forecasted the loss of the Saudi Arabia budget up to 21.6 percent of its GDP for 2015 and 19.6 percent of its GDP in 2016. The oil importers that have survived the political transformation relatively well, primarily Egypt and Tunisia, still have to overcome their economic crises. Acts of terror in both countries have already ruined tourism markets and reduced inbound investment. As a result, a new wave of political destabilisation swept Tunisia in 2016. Thus, the elaboration of a roadmap for the economic recovery of Middle Eastern states in the post-con?ict period and measures for ensuring the region’s economic security are becoming yet another urgent task for the international community. China and other BRICS countries’ involvement in the economic recovery of severely weakened Mid-Eastern states and the subsequent development of new production facilities that will employ younger generations may create new opportunities. It is also worth thinking about the creation of regional institutions capable of consolidating mutual economic interdependence in the region and on the basis of existing structures – the Organisation of Islamic Cooperation (OIC), the Arab League and the afore-mentioned Cooperation Council for the Arab States of the Gulf − or via the formation of new ones. It is also possible to consider the integration of some Mid-Eastern states into the associations of adjacent regions, including the Shanghai Cooperation Organisation (SCO). Expansion of the boundaries of free trade areas could promote trust. Finally, can the global actors draft a new Marshal Plan for the Middle East? The revitalisation of the activities of non-governmental actors, which deprived state agencies of their monopoly on violence, has become a highly important factor in the undermining of stability and a consequence of it at the same time. All kinds of ethnic, political, religious, and tribal groups have entrenched themselves on the ruins of statehood, weakening the remaining structures in the process. DAESH has occupied a special place among terrorist organisations. Not a single terrorist group could compete with it in ideological, propaganda, financial, and military activities. Moreover, the weakening of statehood has made the idea of a caliphate particularly attractive. Ideologists have set forth this path because it could help them resolve many current problems. DAESH has turned archaic ideas into a foothold that the population needs, particularly in an uncertain situation, and has formulated for the people strategic goals, which give them the feeling of being on a mission and, those who needed it most of all, now sense that they were chosen. Their ideological appeal and their large territorial presence in Iraq and Syria have enabled DAESH to go beyond the bounds of a regular terrorist organisation that usually has a limited number of fighters, no territorial base or direct support in the parts of the world where it does not conduct its destructive activities. In a globalised world, DAESH has come to be perceived as a universal threat despite its civilisation-related limitations. Terrorism that uses the enormous technological potentials of the modern world poses the greatest threat to peace and stability. It crosses borders with relative ease, sowing seeds of destruction and fear. The main task of terrorist organisations in the Middle East is to deal blows at everything that does not ?t into their archaic concepts of social interaction and social relations. Russia is particularly sensitive to extremism and terrorism because both have a domestic dimension for Russia. Its history abounds in manifestations of terrorism. Russia is considered to be the homeland of “systemic terrorism” that emerged in the latter half of the 19th century. More recently the growth of the terrorist threat in Russia was primarily linked with the war in Chechnya. However, extremists are still finding supporters among Russia’s multi-million Muslim population. In official estimates alone, 2,719 Russian citizens left for Syria, including 900 from Dagestan, 500 from Chechnya, 130 from Kabardino-Balkaria and 200 from the Volga Region. Although terrorism has a relatively long history, it does not yet have a de?nition that would re?ect all of its aspects and be accepted at the international level. Super high politicisation of the issue of terrorism complicates the search for consensus on the status of individual organisations. The Syrian opposition is a graphic example of the above. Military methods have always been given priority in counter-terrorist activities. The struggle against DAESH is also mostly oriented to military actions because of its activities and territorial claims. At the same time a broad coalition has not been created and if American ground troops start fighting for Mosul and Raqqa, serious changes are likely to take place in the balance of forces. Better coordination of efforts between the United States and Russia and regional participants of both coalitions may not necessarily be the result of such developments. The political process in Syria would help not only to find compromise between the key players on the Syrian political ?eld but would also build up trust between the main external and regional actors, essential for countering DAESH. This will create an opportunity of cooperation between law enforcement and security agencies. Soft forms of the anti-terrorist struggle, including ideological and economic ones, begin to play a special role. Their goal is to unite the world’s Muslim community, including Russia’s Muslims who have the unique experience of peaceful co­existence with other religious groups in a multi-religious and multi-ethnic state. Practically all con?icts in the Middle East are trending towards fast internationalisation. Military interference attracts special attention to the role of global powers, which seem to be increasing their impact on the regional situation, thereby reducing the in?uence of regional players. However, in reality, the increasing involvement of global forces in the confrontation in the Middle East has not only succeeded in not marginalising regional players (including non­governmental ones) but has also prompted Mid-Eastern countries to take more responsibility for reformatting the region. Indicatively, far from coinciding, their approaches to this task often rule out each other. Every leading power has its own national interests that often contradict the interests of other regional and global forces. Complicated relations between Iran and the Gulf countries, the Arab states and Israel, Iran and Turkey, have a long history over the span of which it is not difficult to find various acute crises. Today, Iran and Turkey − the peripheral states – have become more active and this has led to the emergence of new confrontation lines. Key regional players have no experience in building modern institutions (Israel is the only exception, but its model is not in great demand due to the persisting Palestinian issue). This is why they resort to military force in resetting the region. Soft power instruments are being replaced with traditional, ethnic, religious, tribal, or dynasty-related relations and commitments. Rapid development of any tensions into armed clashes or, at best brinkmanship, is becoming a distinctive feature of the situation in the region. Numerous long-standing hot conflicts lower the threshold for resorting to violence against a background of the general increase in the global level of military confrontation. The activities of some radical organisations and even government bodies bear this out. The balance of forces between regional and global powers is also subject to change. Realising the limits of their own potential, regional actors are still interested in relying on their global partners. However, growing ambitions and the stakes in regional fighting compel them to use the power and influence of global players in their own interests. During the Cold War, the region’s countries involved in conflicts were actively drawing their global allies into conflicts the latter had nothing to do with. The rivalry for the collapsing Middle East, which is focused on the struggle for a new or the old world order, is again making the leading powers vulnerable to the influence of regional players. The old regional associations, such as the Arab League or the Gulf Council, are unable to resolve increasingly complicated regional problems, and this leads to attempts to replace them with new coalitions. Such attempts are motivated by considerations of expediency rather than a striving for concerted effort. Thus, the Saudi-established Islamic coalition that unites more than 40 countries in the struggle against DAESH has not been fully institutionalised. States that are not part of it are considered the coalition anti-Shia. 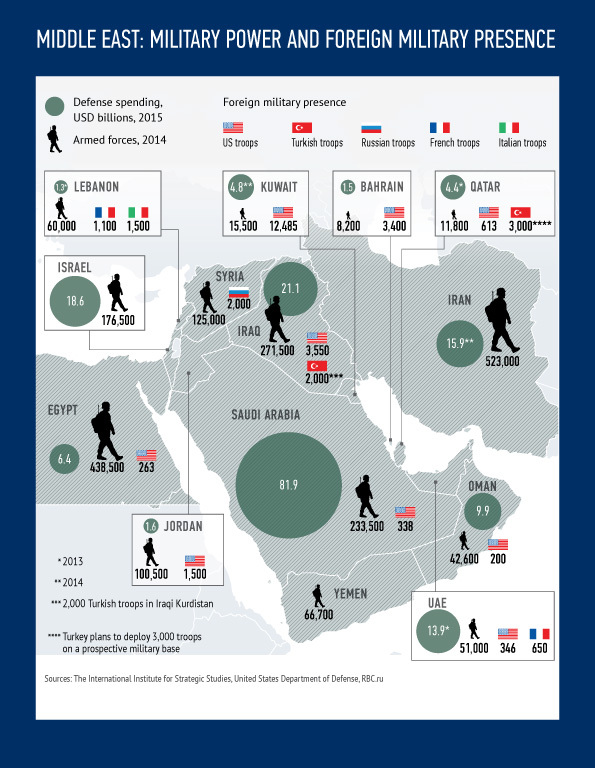 The cooperation of regional and global forces in the Middle East goes beyond regional significance. It concerns the elaboration of agreed-upon and more coherent rules of the game that would exclude the crossing of the response threshold, armed action or the absence of an alternative. This is achievable at the negotiating table with the participation of interested parties, not only as regards individual conflicts, but also the general development strategy in the Middle East and the future of its nations. VII. A Wonderful New World? The situation in the region is similar to the events in Europe during the Thirty Years’ War in Europe and two world wars. In all three cases the fear of the repetition of mass-scale violence and the ensuing doomsday as its result compelled Europe to ponder over the rules and institutions for regulating international relations. Despite the urgency of the situation in the Middle East, it is essential to discuss today measures for overcoming tensions and ensuring regional security. In the last few years con?icts in the Middle East have acquired an increasingly greater hybrid nature, combining “of?cial” inter-state clashes with a civil war. Many con?icts are asymmetrical because the sides have different capabilities and potentials. Some states are confronted by individual groups and movements that are using their own methods of in?icting damage, including terrorism. A special role belongs to external armed interference, the use of which is most often at odds with international law. Both relatively recent hotbeds of tensions (in Syria, Iraq, Libya and Yemen) and those that were inherited from the Cold War and the bipolar world – the Palestinian-Israeli and Western Sahara con?icts, are considered hybrid and asymmetrical. Each new con?ict creates a threat to the security of neighbour countries. Being the epicentre of regional tensions, armed actions in Syria, Yemen, and Libya are becoming a factor of imbalance for the entire Middle East. Despite its long stagnation, the Palestinian-Israeli con?ict is still a stumbling block for the region’s countries because it complicates the formation of a regional security system. Furthermore, it continues to inspire radical anti-Western political forces. The consolidation of the network-like infrastructure of these con?icts – financial, information, and logistic ties between their parties − is creating yet another problem. Attempts to stop or settle these con?icts include either armed intervention with a view to changing the alignment of forces or the search for political solutions – organisation of national dialogue, elaboration of a roadmap that details a sequence of steps towards settlement, collective international mediation, and initiatives of individual states. To form a general regional security system it is necessary to rule out unilateral armed action without the relevant mandate and in violation of international legal standards. Addressing the issue of regional security, including Russia’s concept of creating an area free of weapons of mass destruction, demands that its framework, main tasks and parameters all be rede?ned. The already available de?nitions need to be updated so that they can be combined with those approaches that to a larger degree take into account the modern dynamic of the on-going military-political processes in the Middle East. Use the opportunity to introduce external administration in a state that has collapsed and is unable to provide physical and social protection for its citizens. This answer suggests other questions: Under what aegis? Utilising what resources? What role will be played by global and regional organisations? Establish bodies of government that will be able to regulate cultural diversity and prevent the transition to political rivalries in case of autonomy or federalisation. Prevent the re-drawing of borders by force, render international assistance and grant international guarantees for a “civilised divorce” wherever the change of borders has already taken place or has become inevitable. Launch negotiations for creating a regional security system in the Middle East under the Helsinki pattern.